Hello everyone, and Happy November! I am so glad you stopped by today. I hope everyone had a creepy fun kinda Halloween, and while I could make Halloween projects forever, all good things must come to an end, so on to Fall projects. I have really been looking forward to getting my new stamp set, Fall Collection, from the ever-so-talented Ms. Pam Bray, and now I cannot wait to use it. 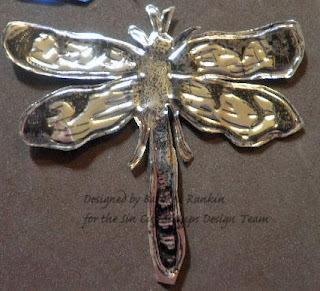 This is just one set of several that she has designed, and I want them all. I recently missed out on participating in an Altoid tin swap due to other commitments, so that has been on my mind lately. I used this Vela-mints tin to begin my altered transformation of a Fall tin to hold an accordion folded tag. The poor tin was beat up a bit, but I managed to cover up some of the flaws. Start by removing the lid. This makes it easier to decorate the tin. 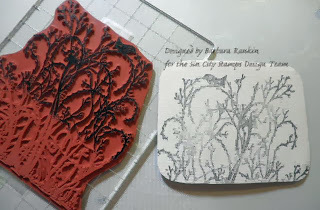 Trace and cut out lid from canvas. 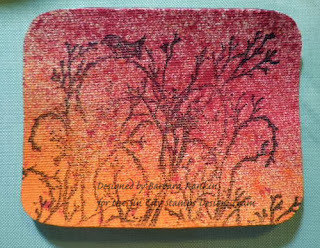 Stamp brush image in black onto canvas; let dry. 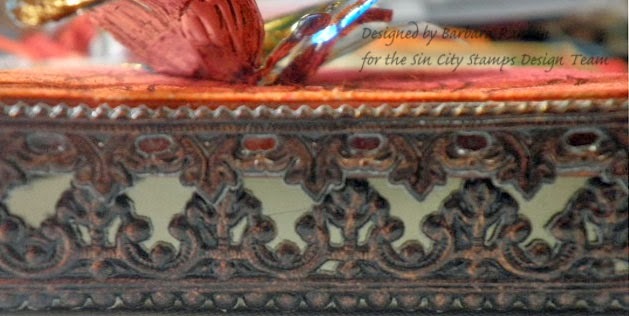 Spritz canvas with cherry and orange ink sprays; let dry. Cover shipping tag with a piece of the Botanique paper. Align the paper at the top of the tag. There will be about 1/4" uncovered at the bottom, but this will be trimmed off. 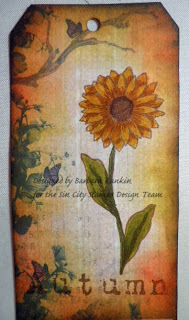 Stamp sunflower onto tag with brown chalk ink; color with markers. As you can see, this paper is rather grey blue, but this can be altered to match my needs. Ink edges of tag with marigold, olive, vintage photo, persimmon, and black distress inks. 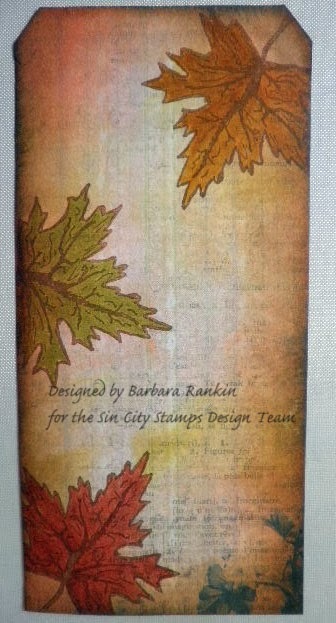 Stamp AUTUMN onto tag with brown chalk ink. Quite a transformation, wouldn't you say? Edge back side of shipping tag with brown chalk ink. Trim second half of print paper down to fit onto back of tag. 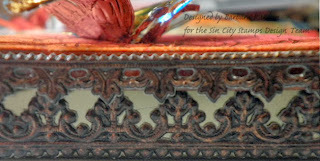 Ink edges as for the front. 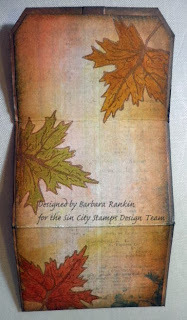 Stamp three leaves onto tag with brown chalk ink. 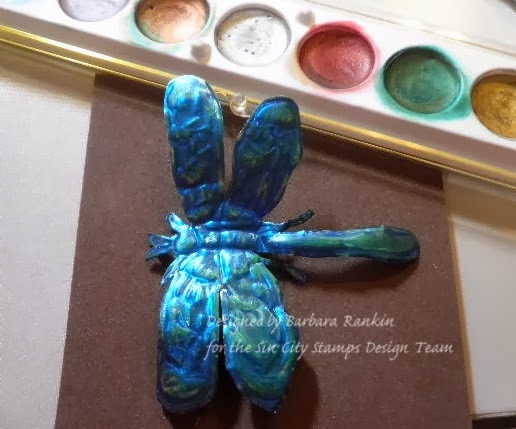 Color with markers. Adhere print paper to center of tag. 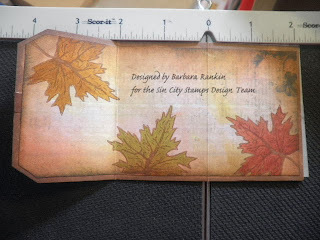 Score tag at 2" and 4" and accordion fold. 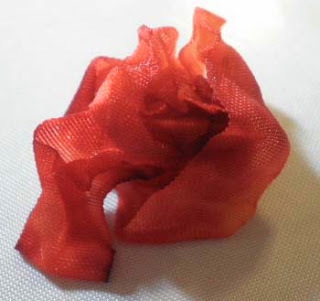 Trim off excess at bottom to make a 6" long tag. 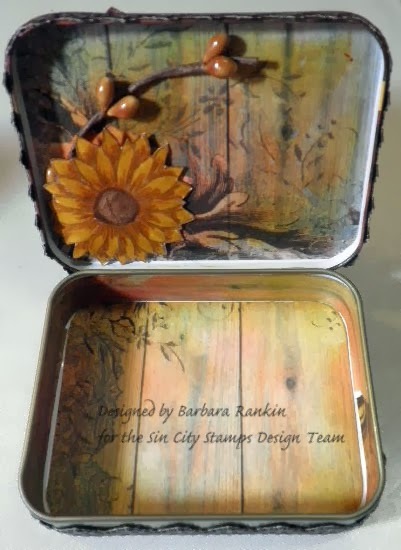 Because this particular tin is smaller than an Altoid tin, I had to trim a sliver off each long side of the tag to make it fit into the tin. 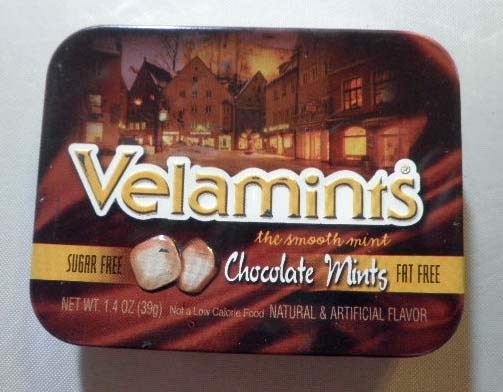 You probably will not need to do this with an Altoid tin, however. I like to color my ribbon to match, so I used off white seam binding and added marigold and brick distress stains to it, crumpled it up and let it dry like that. 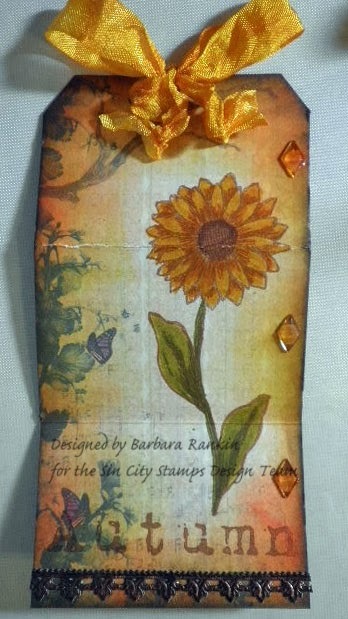 Be sure to re-punch the holes in the tag top so that you can add your ribbon. 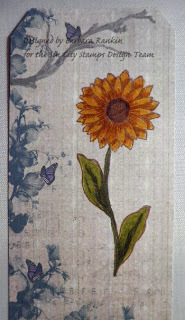 Adhere Botanique print papers to inside lid and bottom, as shown. 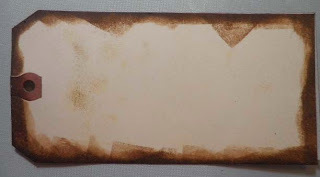 Sponge distress inks over paper to give it more of that Autumn color. Stamp sunflower top only onto smooth vanilla card stock. Color and cut out flower; adhere to inside lid with pop dot and small floral berry twig. Strips of German paper scrap borders were adhered along bottom sides and lid sides. 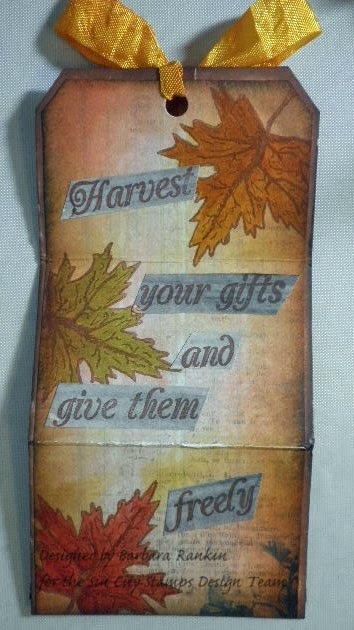 Below is what the inside tin looks like with the folded tag inserted. 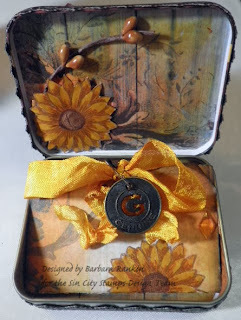 I added a Tim Holtz philosophy charm "Genuine" with a small safety pin to the ribbon. 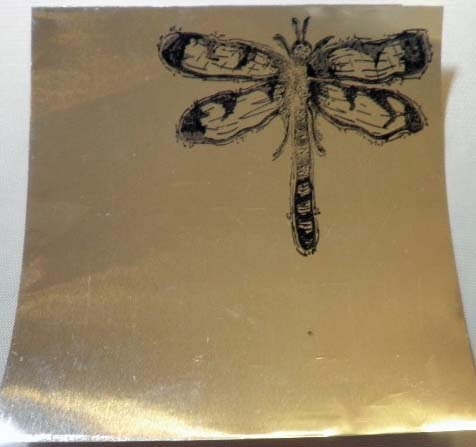 To make the dragonfly on the lid, first stamp onto reverse (silver) side of a piece of blue metal foil with black ink. 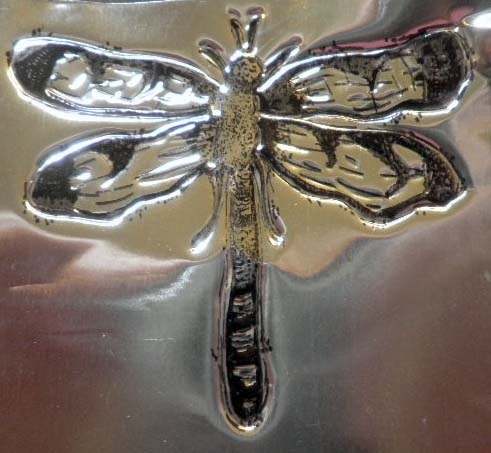 Emboss outside lines of image, and parts of the wings and body. 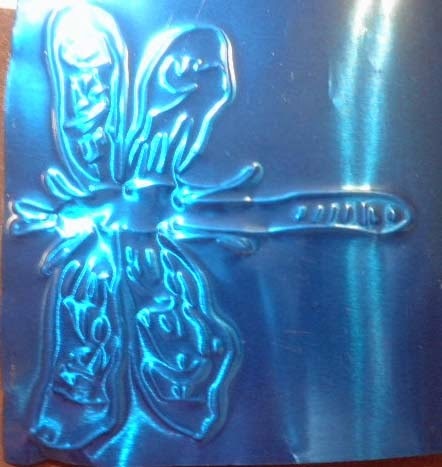 Turn foil over to blue side. 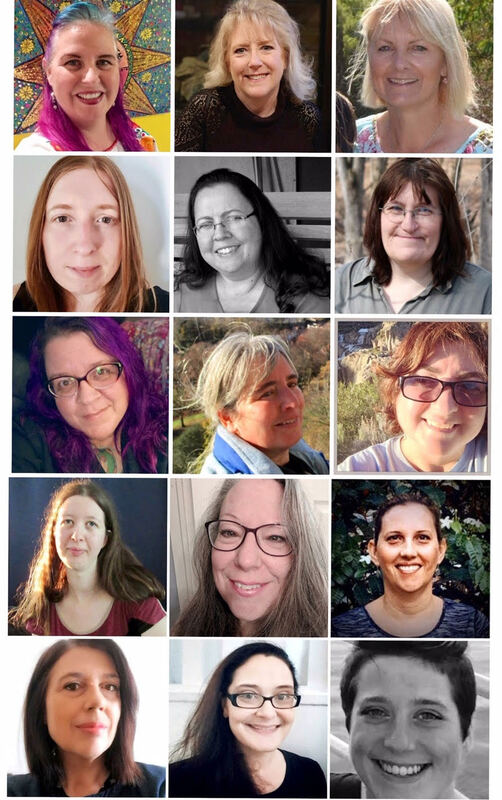 You can now see where to cut out the image. Turn foil back over to the reverse side and finish embossing with the embossing tool. Gently sand off some of the blue foil along the high (embossed) spots. Apply green metallic cream over the high spots that you just sanded. 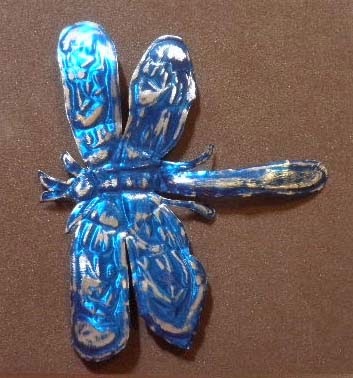 The foil was too blue for my liking, so I pulled out my Glimmer Glazes in Adobe and Olive and gave the entire dragonfly a coat of each color, allowing to dry between coats. Here it is again for a quick look. You can see where the glazes landed in the nooks and crannies for a deeper color while still providing that shine I was going after. I hope you enjoyed my Fall project today and that you will be inspired to create a tiny tin for yourself or to give as a gift. Remember, gift cards fit very nicely into these tins. Thanks so much for stopping by. 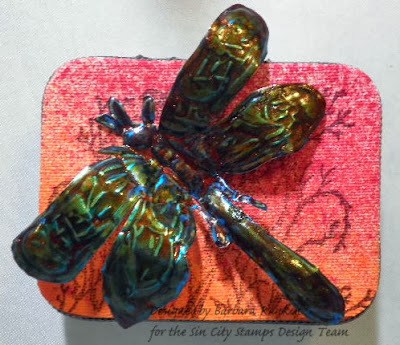 I hope you can visit the Sin City Stamps blog to see what the rest of the team has for you this month, and don't forget to check out all the new stamps and awesome products that Sin City Stamps has for you in their online store. Have a wonderful weekend, and a great Fall! Thanks for sharing! The tin is cool and I love the autumn tag!! stunning, love how you brought the dragonfly to life, love the cool technique and the tag is fabulous. As always you did an amazing job showcasing the SinCity Stamps.